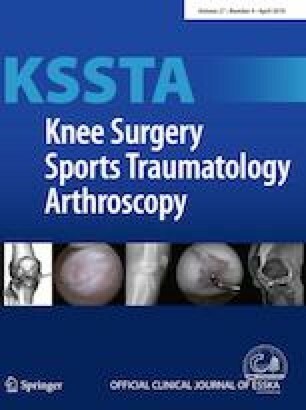 To evaluate the efficacy of the Instability Severity Index Score (ISIS) in predicting an increased recurrence risk after an arthroscopic Bankart repair. Retrospective review of a cohort of patients operated in three different centres. The inclusion criteria (recurrent anterior instability [dislocation or subluxation] with or without hyperlaxity, arthroscopic Bankart repair) and the exclusion criteria (concomitant rotator cuff lesion, acute first-time dislocation, surgery after a previous anterior stabilization, surgery for an unstable shoulder without true dislocation or subluxation; multidirectional instability) were those used in the study that defined the ISIS score. The medical records and a telephone interview were used to identify the six variables that define the ISIS and identify recurrences. One hundred and sixty-three shoulders met the inclusion and exclusion criteria. Of these, 140 subjects (22 females/118 males; mean age 35.5 ± 7.9) with 142 (89.0%) shoulders were available for follow-up after 5.3 (1.1) (range 3.1–7.4) years. There were 20 recurrences (14.1%). The mean (SD) preoperative ISIS was 1.8 (1.6) in the patients without recurrence and 1.8 (1.9) in the patients with recurrence (n.s.). In the 117 subjects with ISIS between 0 and 3 the recurrence rate was 12.8%; in the 25 with ISIS 4 to 6 the rate was 20% (n.s.). For subjects with anterior shoulder instability in which an arthroscopic Bankart repair is being considered, the use of the ISIS, when the values obtained are ≤ 6 was not useful to predict an increased recurrence risk in the midterm in this retrospectively evaluated case series. The efficacy of the ISIS score in defining a group of subjects with a preoperative increased risk of recurrence after an arthroscopic Bankart instability repair is limited in lower risk populations (with ISIS scores ≤ 6). The authors have no conflicts of interest regarding the issues presented in this article.